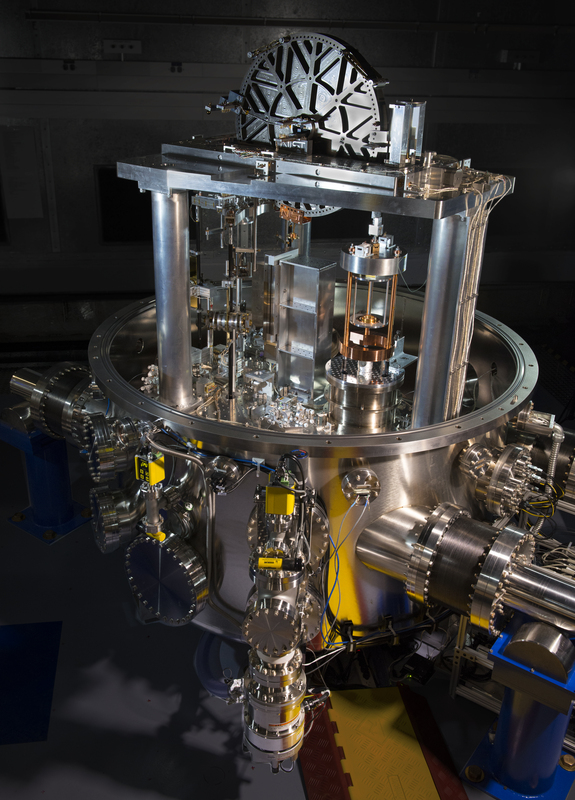 A high-tech version of an old-fashioned balance scale at the National Institute of Standards and Technology (NIST) has just brought scientists a critical step closer toward a new and improved definition of the kilogram. The scale, called the NIST-4 watt balance, has conducted its first measurement of a fundamental physical quantity called Planck's constant to within 34 parts per billion – demonstrating the scale is accurate enough to assist the international community with the redefinition of the kilogram, an event slated for 2018. In this 2016 video, NIST physicist Darine Haddad uses a cup of coffee and sugar cubes to explain the significance of Planck’s constant. In 2017, after this video was recorded, NIST measured a new value of the Planck constant with an uncertainty of only 13 parts per billion. This measurement contributed to the final value the revised International System of Units (SI) approved in November 2018. The redefinition–which is not intended to alter the value of the kilogram's mass, but rather to define it in terms of unchanging fundamental constants of nature – will have little noticeable effect on everyday life. But it will remove a nagging uncertainty in the official kilogram's mass, owing to its potential to change slightly in value over time, such as when someone touches the metal artifact that currently defines it. Planck's constant lies at the heart of quantum mechanics, the theory that is used to describe physics at the scale of the atom and smaller. Quantum mechanics began in 1900 when Max Planck described how objects radiate energy in tiny packets known as "quanta." The amount of energy is proportional to a very small quantity called h, known as Planck's constant, which subsequently shows up in almost all equations in quantum mechanics. The value of h – according to NIST's new measurement – is 6.62606983x10-34 kg∙m2/s, with an uncertainty of plus or minus 22 in the last two digits. Accurate measurement of this tiny number is the key to retiring the physical kilogram, because it provides a way to equate mass with a particular amount of electric energy, which can be expressed as a function of h. If we know h precisely, we can build an electromagnet and measure exactly the amount of electric current it needs to lift a kilogram off the ground, and define the kilogram in terms of the current. Scientists are putting this idea to work in a device called the watt balance, which compares a physical mass with finely measured amounts of electricity (see this story for details of how watt balances work). With enough accurate measurements of Planck's constant, scientists will eventually fix its value to a very high degree of precision, allowing highly accurate measurements of the kilogram. For scientists to agree on a new mass definition that relies on Planck's constant, however, there must be solid evidence that we know h to great accuracy, so multiple countries—five to date—have built watt balances to make independent measurements that can be compared. NIST's measurement, the first using its recently constructed NIST-4 watt balance, is good news because it is consistent with watt balance measurements from other countries and also because the amount of uncertainty in the measurement is far lower than the NIST team had hoped for. Both points imply that the international science community is on track to redefine the kilogram by its self-imposed 2018 deadline. "This measurement was essentially a dry run," said NIST physicist Stephan Schlamminger. "We were hoping to achieve an uncertainty of within 200 parts per billion by this point, but we got better fast." For the redefinition to meet scientists' exacting standards, at least three experiments must produce values with a relative standard uncertainty of no more than 50 parts per billion, and one with no more than 20 parts per billion. All these values must agree within a statistical confidence level of 95 percent. The results also must be reconciled with the alternative "Avogadro" method, which involves counting the atoms in an ultra-pure sphere of silicon. Because Planck's constant is important for quantum electrical standards, the overall effort also will benefit electrical metrology, Schlamminger said. Fixing h's value will explicitly connect the quantum based standards for the ohm and the volt to the international system of units for the first time. *D. Haddad, F. Seifert, L.S Chao, S. Li, D.B. Newell, J.R. Pratt, C. Williams, and S. Schlamminger. A precise instrument to determine the Planck constant, and the future kilogram. Review of Scientific Instruments. June 21, 2016. DOI: 10.1063/1.4953825.